I enter her room without knocking. My mother is lying there dozing, her legs draped over the side of the bed, feet barely touching the floor, her head resting on the pillow. I find her like this often, a tiny old woman twisted in day-dreaming sleep. “Mother,” I say softly, wanting her to wake but also hesitant to disturb. I wait and say again, “Mama.” Her eyes open. She tries to focus as if arriving from some faraway, blurry place where I sense she spends much time. She recognizes me and says, “I love you,” almost like a rehearsed phrase etched in layered memory. Her mind has in most ways slipped far away. She has no idea where she is, what she just did, or even how to get to her own bathroom ten feet away. I am very grateful she has chosen to love me so tenderly these past few years. She could have turned away because I have so much control over her life, and she hates that. She was feisty and fiercely independent in her younger days—and sometimes jarringly critical. “Where are the children?” she asks me, as we continue our conversation on her bed. “There are so many of them, and you’re always taking care of them. You work too hard.” She’s quite fearful when I bring the young great-grandchildren to visit, because she’s afraid they’ll cause her to fall. The last time she fell—because of her own unsteadiness—she ended up in the hospital for two months. She can’t keep track of how many children she or I have or where they are. Sometimes I remind her with sadness that two of her sons had brain cancer and died, as I try to help her make sense of the familial past and present. When we meet other people in the home, she often introduces me as her mother. I usually let that pass because I do in fact act like her mother. I buy her clothes—she still knows exactly what she likes, and when we try them on, slowly and somewhat painfully, she says, “No, this is not good,” or “I like this color,” or sometimes impatiently, “It’s fine, it’s fine. Why do you bother? I don’t need anything.” I control her money. I talk to the administration of her residence when she complains or I want her to receive more attentive care. I am grateful that they still let her stay, given the state of her dementia. She can do nothing for herself. The attendants dress her, change her diapers, which she soils regularly, keep her clean, and direct her to activities, many of which she now refuses to attend because she is too tired. She often gets obstreperous with the helpers because she is offended by her lack of privacy when virtual strangers take off her pants in order to clean her up. She’s right to be offended. I don’t know what to do about it. At the same time, though, her intuitive capacity can still be stunning. She senses relationships with the same acuity she always did; she has her finger on some political pulse, even though she doesn’t read any more; and she remembers the essence, if not the details, of past experiences. Sometimes when I am sitting near her, holding her hand or cutting her fingernails, I suddenly remember the vibrant, dogged woman who almost single-handedly kept Manhattan’s Union Square an historic monument, protecting the area from developers. Or the woman who generated a program and money for talented inner-city kids so they could develop their artistic gifts, or the woman who was the prominent force in building an AID’s house in her neighborhood. She was one of sixty characters chosen eight years ago to be in a book that describes unique and important people in the landscape of New York. Her section is entitled “The Little Old Agitator.” She was 84. I noticed that she seemed unusually sad. “Are you upset that I am leaving?” I asked. She was quiet for a few minutes. Tears were rolling down her face. “It’s my mother. I can’t believe she’s gone. I miss her so much.” Tears also filled my eyes as I sat with my arms around her. I was acutely aware of her severe diminishment, her impending death—as well as my own complicated grief. I asked myself why she is alive if she no longer experiences any pleasure. My life would be easier if she were dead. I worry that I never give enough to make her happy. In the midst of these thoughts, I realize that it is getting late. I get up, kiss her gently, and walk to the outside door. As I start to leave the building, I turn and look back. Mom is sitting on the couch alone in the hallway, having no idea at all what she is supposed to do next. 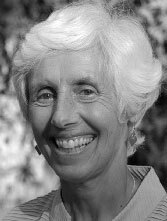 Jane Ariel is a family therapist and on the faculty of the Wright Institute in Berkeley, CA. The parent of partnered sons and the grandmother of three, she recently was the primary caregiver to her mother, who has now passed away. She travels widely, is trilingual, and is a national consultant with Visions, Inc. on issues of multiculturalism. She has written articles on alternative families, Jewish mothering, and on a women's group that has been together for twenty years. View More: Next piece "Unexpected", Home, Archive.